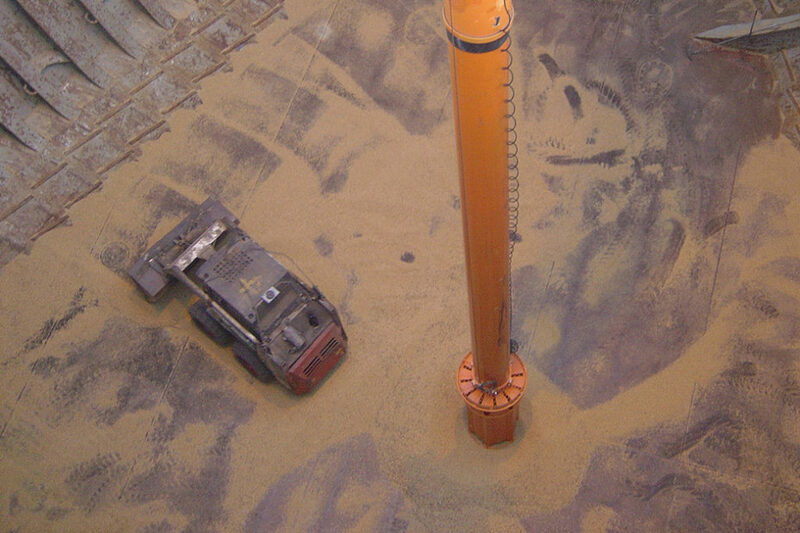 NEUERO’s pneumatic unloaders use the flowing characteristics of bulk to feed the shipunloader. A key benefit is that NEUERO’s pneumatic unloaders can pick up the material directly from the bottom of the hatch, similar to a vacuum cleaner. This fact alone results in efficient unloading performance in pneumatic discharges. The discharge capacity of NEUERO’s pneumatic machines is 75-80% of the bulk material. The pneumatic conveying of NEUERO requires relatively little steel to carry the material and thus less weight. As a result, fewer tires can be used, resulting in leaner foundations and thus lower costs at the quayside. The slim design results in low acquisition costs. With NEUERO’s pneumatic unloaders, the residual cleaning in the hull of the ship becomes easy. Easy replacement of spare parts is possible. NEUERO’s pneumatic unloaders can be flexibly used for different ship sizes. Thanks to NEUERO’s pneumatic unloaders, nearly dust-free work is possible with hardly any grain fracture. Due to the efficient residual cleaning and continuous unloading, NEUERO’s pneumatic conveyors have a high unloading power. In summary, the advantages of NEUERO’s pneumatic unloading systems include the following points: Low investment costs, high efficiency, low-noise-emission, nearly dust-free unloading and consistently very good unloading capacity! Would you like to know more about pneumatic conveying? We are happy to send you this exclusive textbook free of charge as a PDF. Just send us a short message.